On the Tuesday before last I was fortunate enough to receive the very great honour of being invited to attend the famous 'Monks' Tea Party' in the grounds of the magnificent Rumpleford Abbey in Oxfordshire. I should point out that whilst there are many who have witnessed this extraordinary occasion for themselves, few outsiders have ever been asked to participate. I therefore found myself in great anticipation of the event, and the subject of much envy by my colleagues. Rumpleford Abbey, founded in 1506, is one of the few to have survived Henry VIII's dissolution of the monasteries and is dedicated to St Jemima of the Holy Rock, the patron saint of gravel. Architecturally, it is quite a remarkable example of medieval craftsmanship, and new visitors to the site are inevitably awed by its extensively carved vaulted halls and the wide sweeping arches that threaten to enclose the sky itself. But there's something else about the place that takes the breath away; something elusive and unseen, yet undeniable. Possibly, it's the feeling of history one gets when standing in the shadow of its great walls. Or maybe it's the sense of godliness, of sanctity, of an unshakeable belief so strong that even the most secular of visitors can feel it emanating from the very ground. Whatever the explanation, Rumpleford Abbey is steeped in an atmosphere that is derived from more than just bricks and mortar. Monastic life has always followed a slow and steady pace here, and a careful study of the history of the abbey will reveal little by way of drama or incident. During the seventeenth and eighteenth centuries the number of monks living here swelled to somewhere in the region of two hundred, but since then the order has steadily dwindled. In 1977 the brotherhood was down to twelve and the possibility of Rumpleford Abbey being forced to close was a very real one. Had it not been for the foresight of the Abbot at that time, Father Robert Grass, this secluded island of pastoral calm may have been buried beneath some ghastly out-of-town retail park. Its terraced allotments and delicately tended rose gardens may have been consumed by an arid tarmacadam playa with bays marked out for over eight hundred cars. Its cool, shaded cloisters, echoing to the timeless drip, drip, drip of water on ancient stone, may have been engulfed by a family theme pub with a fake mahogany bar and a play area for the kids. And its chapel - ah, the Chapel! The very heart of the abbey, where the air itself seems steeped in faith as if generations of prayer are clinging to the warm motes of dust that float in the fusty air - well, that could so easily have been devoured by the sound and vision section of a major electrical retailer. Father Grass saw all these things as distinct possibilities, and realised that if the abbey's proximity to the A329 could be advantageous to a potential developer, it could also be of service to the brotherhood. He was aware that attempts at raising revenue had been made at many similar locations by capitalising on the tourist and day-tripper market - discretely and tastefully, of course. But Father Grass realised that it would take more than picture postcards, souvenir plates and novelty pop-up prayer books to really make a difference. Oh no, he was determined to go about it properly. Father Grass spent the next year and a half working out every detail of his plan. He spent many long hours in consultation with all sorts of experts and advisors - engineers, financiers, marketing people, management consultants... hell, even the odd bishop. He spent months touring Europe looking for investors with the vision to back his ambitious scheme. Eventually his ideas came together and coalesced into a solid, workable project, and in the spring of 1979 'Monkworld' finally opened its gates to the public. There was, inevitably, much criticism surrounding Father Grass's decision to turn Rumpleford Abbey into a theme park. Some thought that the hall of mirrors, the Ferris wheel and the pirate ship would prove damaging to the dignity of the institution, and be at odds with the quiet, contemplative existence traditionally pursued by the monks. Father Grass responded to such objections by pointing out that the monks were loving it and that, anyway, many of the rides were instructive, indicating clear religious themes. The rollercoaster, for instance, was a very obvious analogy for life: full of ups and downs, but reminding us that whenever we are at our lowest, God is always there to pull us up to the next peak. And then there was the log flume, of course - if that wasn't the perfect illustration of the importance of baptism, then Father Grass really didn't know what was. That said, Grass was sensitive to the need for some sort of religious dimension to the day-to-day routine of the monastery. He saw Monkworld not just as an opportunity to make money, but also to educate the public about life within the order. 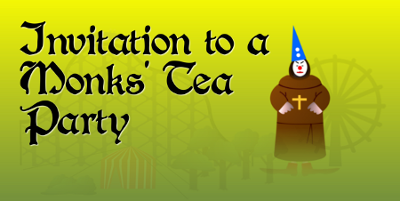 He wanted to public to be able to come in and see monks in their natural habitat, going about their everyday tasks, and to this end he instigated the Monks' Tea Party. Now, some twenty-five years later, the daily Monks' Tea Party is what Rumpleford Abbey is best known for, not just locally, but all over the world. Monkworld has spent millions on providing the very latest, state-of-the-art rides and attractions. It has sacrificed several acres of its grounds to provide extensive parking for the visitors that throng here each summer. It can boast the most diverse selection of restaurants and family theme pubs of any attraction in Europe. But it is images of the Monks' Tea Party that adorn the mugs, the T-shirts, the key rings and the baseball caps that are sold in the gift shop in the abbey's chapel. Father Grass's untimely death in 1983, beneath the hooves of a rampaging wildebeest from the abbey's petting zoo, prevented him from seeing his vision reach its maximum potential. But I think he would have been proud. I know that I'm feeling quite proud as, in the company of seven other monks, I walk out into the main quadrangle and seat myself at the table that has been erected in the central enclosure. The crowd is already gathered around the perimeter, segregated from the monks by sturdy wire netting. A huge round of applause goes up, and I feel simultaneously elated and slightly self-conscious. It's been like this for years now: every afternoon, at four o'clock precisely, the monks come out to take tea, and every afternoon an eager congregation is waiting for them. In thirty years the Monks' Tea Party has only ever been cancelled twice - once, as a mark of respect on the occasion of Father Grass's funeral, and then again in 1995 when Brother Maynard was unexpectedly struck by lightning whilst reaching out for a chocolate digestive. There seems no possibility of inclement weather upsetting today's proceedings. It's a particularly warm and pleasant afternoon as the china cups are passed around the table. Brother Kneddley, sitting beside me, kindly pours the Earl Grey from a large, earthenware teapot. Orange squash and fizzy pop are also available, and I notice that most of the monks favour the latter choice. Brother Kneddley, I should mention, is a relative newcomer to the tea party. Most of the other monks have been participants in this charming ritual since its instigation, but up until last June Brother Kneddley was an operator on the 'Pilates of the Caribbean' - an interesting ride which takes as its premise the highly speculative idea that the descendants of the Roman procurator Pontius Pilate were all bloodthirsty buccaneers who hung out in the West Indies. Brother Kneddley told me that he had gained his promotion to the tea party through 'dead man's shoes'. Quite literally in fact - a vacancy had arisen after an elderly monk had expired, mid-sitting, and fallen face first into a Victoria cream sandwich. Competition for the position was fierce, and when Brother Kneddley was told that he had been successful, he was over the moon. He was also delighted to learn that his predecessor's footwear came as part of the deal, and he took great delight in showing me his battered leather sandals under the table. This sort of friendly banter exemplifies the spirit of the occasion, but then the food starts to arrive and the conversation is reduced to a glimmer as we eye the large mounds of sandwiches that are piled up in the centre of the table. Once the paper plates have been handed around, we begin to tuck in. The egg and cress is pleasant, the salmon and cucumber is acceptable but I have been advised to avoid the tinned ham. There are sausage rolls and crisps of various denominations, but when I mention that all we are lacking is the cheese and pineapple on sticks, I am met with a moment of stunned silence, followed by a low voice at my elbow explaining that 'cheese is the devil's work'. I am a little unnerved by the effect of my faux pas. I'm also slightly unsettled by the crowds that surround us, chattering amongst themselves, pointing and clicking away with cameras at every mouthful. I ask Brother Kneddley if he ever feels intimidated by being on display like this. Sometimes he does, he tells me. But he explains that he is a born performer - to him, being in front of a crowd like this is his food and drink. I try to divert my attention from the spectators with a steadfast examination of the buildings on the edge of our enclosure. Walls are set like ragged teeth against the darkening sky; broken rooftops and smashed towers suggest a history of violence, but I am assured that the damage is recent and that the impression is false. These scars are not the result of cannon fire or catapult, but of wrecking ball and pneumatic drill - the abbey has been deliberately distressed to imply a much more dramatic past than it can realistically lay claim to. As I meditate on this I am suddenly distracted by a corned beef and pickle sandwich that hurtles through the air, just three inches shy of the end of my nose. It lands with a damp 'plop' on Brother Kneddley's shoulder and he, with impeccable timing, slowly cranks his head to peer at it with disdain. I cannot help but suppress a giggle, and this quickly metamorphoses into a guffaw as a scotch egg comes careering down from the other end of the table, bounces twice then buries itself deep in a bowl of salt and vinegar flavoured Pringles. There is also much laughter from the crowd, followed by a spontaneous round of applause. They've come from miles around to witness the anarchic antics of these mischievous monks, and they're not going to go home disappointed. The table erupts into a frantic flurry of performance as food ricochets back and forth. Peanut butter sandwiches are smeared across faces, beakers of Ribena are upended over heads. It's impossible not to get involved, and as soon as I am caught in the crossfire I retaliate by launching a furious fusillade of vol-au-vents across the battlefield that had once been merely a table. And then, just as it seems that all the ammunition is spent, the jelly and the ice cream arrive and the whole thing kicks off again. One poor man's face is pushed into a trifle the moment it is set upon the table. Another finds himself struggling to prevent the greater portion of a blancmange from being rammed down his cassock, but still manages to get in a good retaliatory swing at his attackers with a treacle tart, in spite of his discomfort. By the time our little tea party is over, the table and its immediate vicinity are awash with confectionery, making it treacherous underfoot as we get up to leave. The applause is deafening, the crowd are ecstatic. 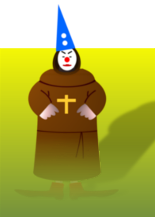 It appears that each of the monks has their share of supporters in the crowd, for I notice waving banners bearing legends like "Give 'em Hell, Brother Redmond" and "Watch out for the pretzels, Brother King". There is a good spirit amongst the monks as we all pile into the communal showers to rinse the coleslaw from our shoulders and wash the jelly from our necks. Everyone agrees that it was a good show, and there's even some playful flicking of towels as we climb back into fresh vestments. The sun is setting as I emerge from the shower block and Monkworld is beginning to close for the evening. 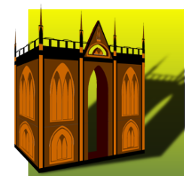 For the visitors, and for myself, there is a brief opportunity for one last go on the Tower of Babel Helter Skelter or Ezekiel's Flying Saucer ride, and maybe a quick visit to the gift shop to pick up a novelty revolving friar. Then it's time to leave. I'm sad to go, but it has been an amazing day: one that has left me with many happy memories and a deeper understanding of monastic life. But I'm worried that my experience has also left me with a sizeable chunk of pork pie wedged in my left ear, so as I pull out onto the main road and point the car in the direction of home, I make a mental note to book an appointment with my doctor in the morning.